Buy your dream car using the carefully collated information here - Get complete information on Tata Tiago - prices, engine performance and other features in this exhaustive automobile and bike section. Madrasi.info is your Chennai city guide. From automobiles to education, from latest cars to travel destinations, you will find it all here. Tata Tiago has quietly shaken the compact car segment with its features and disruptive pricing. Tiago is a winner in compact car segment. Tata Tiago has quietly shaken the compact car segment with its features and disruptive pricing. Tata Motors have a solid reputation of offering 'more car per car'. Their cars have oodles of space, features, design and VFM. They had some issues with poor panel gaps and inconsistent build quality. Not any more. Tiago comes with top notch build quality hitherto not seen in Indian Car manufacturers. The doors of Tiago closes with a reassuring 'Thud' heard only in European cars. Available in 5 variants: XB is the base variant while XZ is the top end with all features. XT is the middle/top variant with most features available at least 1 lakh above its price. 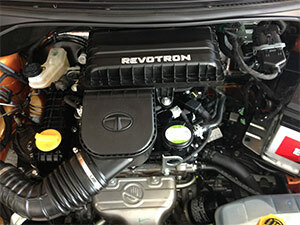 The petrol version - Revotron 1.2 Liter engine belts out 85 BHP and tips the scale at 1 ton. They have not sacrificed the body panels for economy and you rarely hear the 3 pot engine 'thrum'. The engine ECU comes with 2 on-the-fly selectors - City mode and Eco mode. The eco mode on the highway offers unbeatable economy - upwards of 20 + km per liter of fuel. Pretty impressive - you will say when you take it for a test ride. The base version with petrol engine sells for Rs.3.20 (Showroom price) while the top end XZ sells for a shade less than Rs.4.5 Lakhs. Unlike other cars in this price range, Tata Tiago throws in safety features like - ABS, EBD, Airbags, Harman ICE with 4 speakers and digital display. With Tiago, Tata Motors has a sure winner in this class. Tiago spells class like its global Brand Ambassador Lionel Messi. 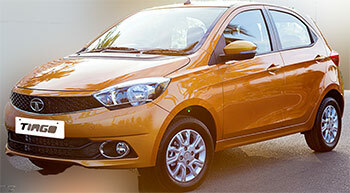 Tata Tiago Specifications: Tata Tiago has 3 cyl 1198 Revotron engine which delivers 85 BHP with a torque figure of 114 Nm. This model comes with Air conditioning as standard fitting. Tiago from Tata has Power steering and Power Windows. It is outfitted with central door locking in tune with its class. Tata Tiago - Small Car segment is equipped with a 5 speed gearbox. Tata Tiago Price: Tata Tiago in India costs approximately about Rs. 3.2 lakhs (showroom price)for the base version in Chennai( Price may vary depending upon the local taxes and Octroi ) at the time of publishing this page. Please note that the car manufacturer - Tata may increase/decrease the list price at any time. Again you may note that the price mentioned here is for the Petrol variant. On the road price will depend on the GST, Road tax, Insurance and extended warranty fees if any. Tiago Fuel Economy: This car runs 18 km per liter of Petrol in city driving conditions while it runs 24 km per liter of Petrol in highway conditions. In other words, the fuel economy of Tiago is Rs. 4.44 per kilometer. If you drive about 1000 km in a month, you will be spending about Rs. 4440 on your fuel ( at the prevailing fuel price in Chennai). Your actual mileage may vary. The information presented in this page has been collected from the respective web site of the manufacturer amongst other reliable sources. We have summarized the various features of this Tata Tiago in a tabular format below.